To help brighten up the sterilized sea of cubicles where I work, each holiday we decorate a pass-through/hallway. It helps give the place a little color, and is a good excuse not to be at our desks for 15 minutes. We also include a plate of cookies or bowl of candy related to the holiday. For St. Patty’s we did the usual: green clovers, pictures of green beer and leprechauns. My cube mate (the quiet male) cut up shapes of Lucky Charms cereal out of colored paper: pink hearts, yellow moons, orange stars, green clovers, blue diamonds, and purple horse shoes. Very creative. I thought we needed a real box of Lucky Charms cereal to complete the decorations. 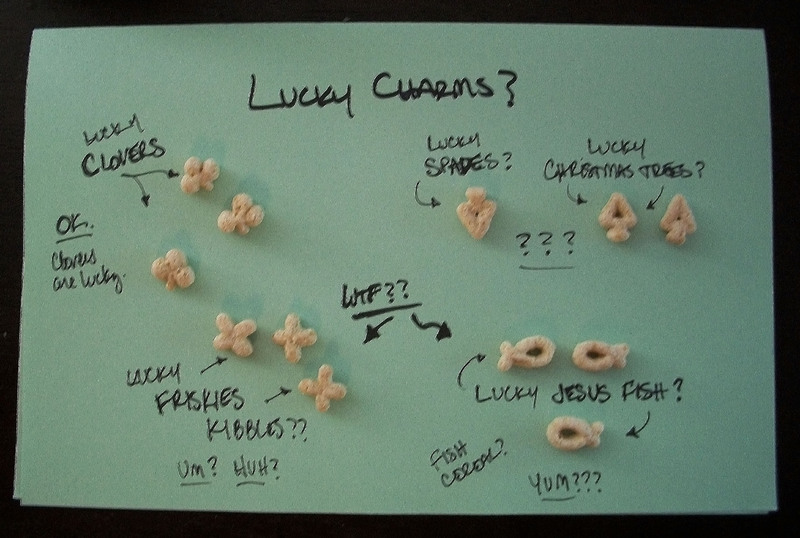 Mind you, it had been years since I last saw the contents of Lucky Charms. Lucky Clovers? Ok, check. Clovers are lucky. Lucky Spades? Lucky Christmas Trees? Umm, huh? Lucky Friskies Kibbles? Uhh… Lucky Jesus FISH?? Yum? A magically religious cereal? Are they trying to elicit a spiritual experience for breakfast? Or should I be sharing the Lucky Friskies Kibbles with my cat? OK General Mills, don’t make any sudden movements. Just put the box down and back away from the cereal.